I've reported in the past that propolis is a promising anti-cavity agent. Now we have even more data to support this. Several investigations carried out with propolis and its many compounds showed that it could reduce the bacteria Streptococcus (cavity causing bacteria) and interfere with their ability to adhere to your teeth. The ability for these bacteria to stick to the teeth are considered a vital step in the establishment of cavities. 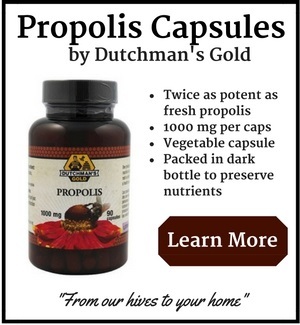 Data from human studies have also demonstrated propolis' ability to reduce plaque. Now researchers at the National Autonomous University of Mexico are using propolis to fight cavities. These researchers also tested the effects of propolis on Porphyromonas gingivalis, a bacteria which is implicated in certain forms of periodontal disease. In a study published in the journal BMC Complementary and Alternative Medicine, more evidence that Propolis kills the bacteria that cause tooth decay was found. Cavities are an infectious disease and there are different types of bacteria involved in the process. Synthetic antimicrobials are commonly used against this disease; however, many of these substances cause undesirable side effects like vomiting, diarrhea and tooth staining. Three formulations of a propolis based toothpaste containing different concentrations of propolis (5%, 10% and 15%) were produced and applied to animal teeth. The Propolis-based toothpaste showed antimicrobial activity stronger than chlorhexidine based products against all oral bacteria that cause cavities. Chlorhexidine is an antibacterial used as a disinfectant and in other applications like mouthwash designed to reduce dental plaque and cavity causing bacteria. It is considered the gold standard of over the counter products for plaque and cavities. It is also toxic in relatively low doses. 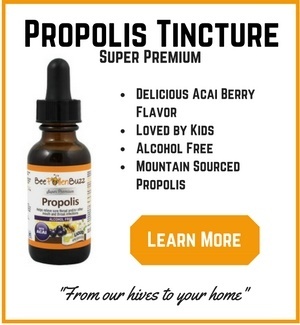 The fact that propolis outperformed it is remarkable. 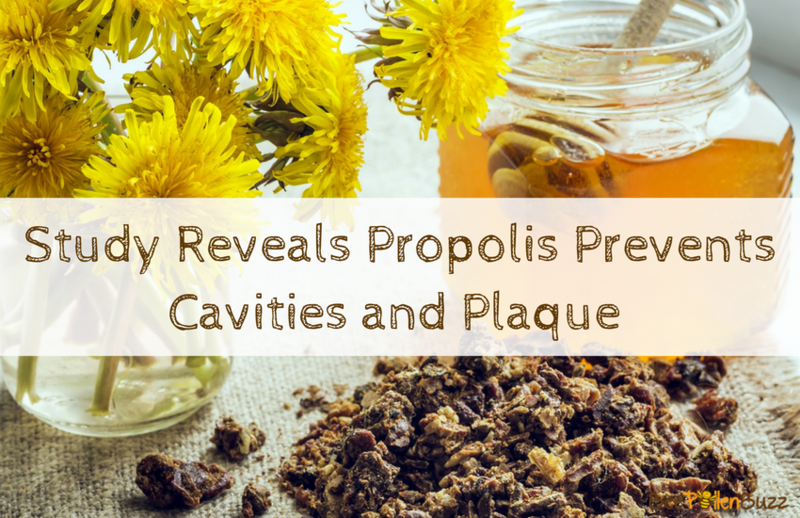 Not only does propolis appear to prevent cavities, but there is now evidence that it is effective for reducing plaque formation as well. In fact, in a recent study it was found to be more effective than Colgate Total toothpaste at doing so. A double blind, randomized, crossover study design was conducted among thirty dental students. After oral prophylaxis (a cleaning procedure performed to thoroughly clean the teeth), the students were given a washout product for one week period. They were then made to brush for 1 minute with the Propolis toothpaste (the study was blind so they didn't know which toothpaste they were using, nor did the researchers). The baseline plaque scores were then recorded. They were then refrained from oral hygiene for 24 hours, and were recalled to be re-measured for plaque formation. After a two week washout period, they then switched to the Colgate Total toothpaste. Again, they didn't know which toothpaste they were brushing with. Upon completion of the study, it was found that there was a significant difference in 24 hour plaque scores between the test products evaluated. The Propolis toothpaste resulted in consistently and significantly lower MGMPI plaque scores than the Colgate Total toothpaste. MGMPI is the Modified Gingival Margin Plaque Index, which is a validated and reliable clinical method for assessing the efficacy of products in reducing plaque build-up. The researchers concluded that Propolis is safe and effective in reducing plaque accumulation when compared to Colgate Total toothpaste. So what are you to do in order to gain these oral benefits? Using a propolis based toothpaste is the easiest and most logical first step. You can also consider adding a drop or two of an alcohol free propolis tincture to your toothpaste right before brushing. I have found significant benefits brushing my teeth with a propolis based toothpaste (non-fluoride) and simply adding one drop of an alcohol free tincture to my brush once a day. I combine this with regular flossing and this has really helped my gums become less sensitive. I also haven't had a cavity since I began this protocol, which is interesting considering I no longer use a fluoride based toothpaste and our water filtration system removes any fluoride in our water. 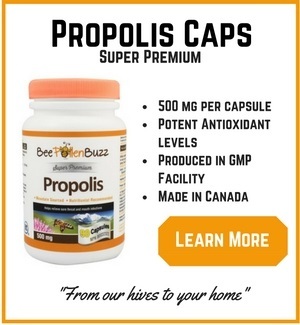 I also feel there may be some value in taking propolis internally by capsule to support dental health. 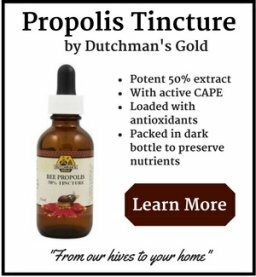 While there are no studies that I am aware of at this time to support my theory, numerous clients and customers have reported success simply taking propolis by capsule.